If you have a background which is classed as Unskilled then it means that you usually work in a manual labouring/warehouse position where you do not need specific skills but learn them along the way. 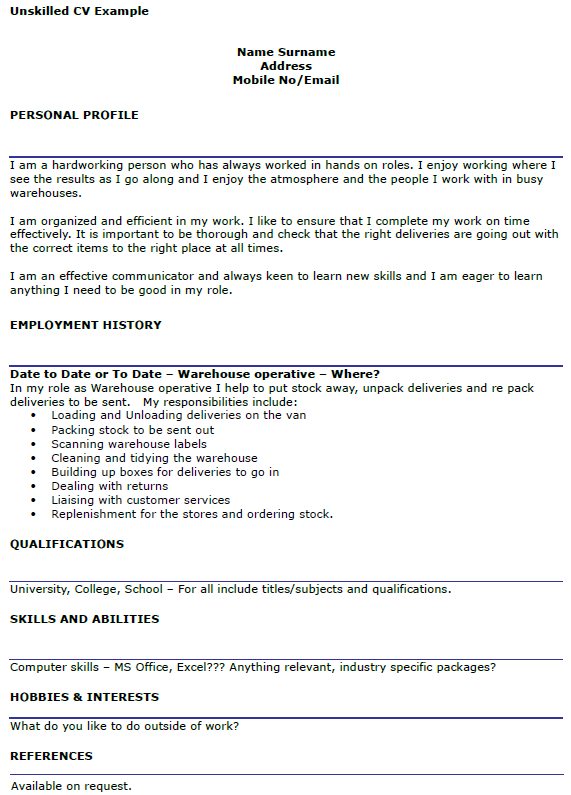 For any unskilled role, you may work in a busy warehouse packing and picking stock for deliveries. You will need to be organised and think and work fast as you could be required to do a lot of packing of deliveries in one day. You will need to have a good standard of general education and be competent reading labels and using usually a hand held scanner and a printer. You will need to have good communication skills and be able to work well with others to ensure that as a team the work gets done in accordance with the timescales. If you are looking for help in writing your CV before applying for roles, please see the below example which you can use as a guide. I am a hardworking person who has always worked in hands on roles. I enjoy working where I see the results as I go along and I enjoy the atmosphere and the people I work with in busy warehouses. I am organized and efficient in my work. I like to ensure that I complete my work on time effectively. It is important to be thorough and check that the right deliveries are going out with the correct items to the right place at all times. I am an effective communicator and always keen to learn new skills and I am eager to learn anything I need to be good in my role. 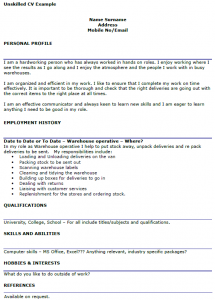 Date to Date or To Date – Warehouse operative – Where? Replenishment for the stores and ordering stock.